The Yaqui or Yoreme are a Native American tribe who originally lived in the valley of the Río Yaqui in the northern Mexican state of Sonora. Many Yaqui still live in their original homeland, but some live in Arizona as a result of wars between the Yaqui and the Mexican government. The Yaqui call themselves Yoreme, the Yaqui word for person (yoemem or yo'emem meaning "people"). Their language is one of 30 in the Uto-Aztecan family. The Yaqui call their homeland Hiakim, from which the name "Yaqui" is derived. They may also describe themselves as Hiaki Nation or Pascua Hiaki, meaning "The Easter People", as most had converted to Catholicism under Jesuit influence in colonial Mexico. In the past, the Yaqui subsisted on agriculture, growing corn, beans, and squash (like many of the natives of the region). The Yaqui who lived in the Río Yaqui region and in coastal areas of Sonora and Sinaloa fished as well as farmed. The Yaqui also made cotton products. The Yaqui have always been skillful warriors. The Yaqui Indians have been historically described as quite tall in stature. The Yaqui conception of the world is considerably different from that of their European-Mexican and European-American neighbors. For example, the world (in Yaqui, anía) is composed of five separate worlds: the desert wilderness world, the mystical world, the flower world, the dream world, and the night world. Much Yaqui ritual is centered upon perfecting these worlds and eliminating the harm that has been done to them, especially by people. Many Yaqui have combined such ideas with their practice of Catholicism, and believe that the existence of the world depends on their annual performance of the Lenten and Easter rituals. The Yaqui were never conquered militarily by the Spanish, and they defeated successive expeditions of conquistadores in battle. They were converted to Christianity by Jesuit missionaries, who convinced them in the seventeenth century to settle into eight towns: Pótam, Vícam, Tórim, Bácum, Cócorit, Huirivis, Benem, and Rahum. For many years, the Yaqui lived peacefully in a relationship with the Jesuit missionaries. This resulted in considerable mutual advantage: the Yaqui developed a productive economy, and the missionaries used the income to extend their missionary activities further north. In the 1730s, the Spanish colonial government began to alter this relationship, and eventually ordered all Jesuits out of Sonora. This created considerable unrest among the Yaqui and led to several rebellions. The Franciscan priests who were supposed to replace the Jesuits never arrived, leaving the Yaqui with no Spanish Catholic religious leaders. The Yaqui leader Juan Banderas, executed in 1833, had wanted to unite the Mayo, Opata, and Pima tribes, together with the Yaqui, to form an alliance separate from Mexico in the 1820s. His effort failed and the Yaqui remained within the scope of Mexican legal authority. The nation suffered a succession of brutalities by the Mexican authorities, including a notable massacre in 1868, in which the Army burned 150 Yaqui to death inside a church. The Yaqui leader Cajemé led another effort for independence in the 1880s. Following this war, the regime of Porfirio Díaz subjected the Yaqui to further brutality. He ordered a policy of ethnic transfer, in order to remove the Yaqui from Sonora and encourage immigration from Europe and the United States. The government transferred tens of thousands of Yaqui from Sonora to the Yucatán peninsula. Some were sold as slaves and worked on plantations in Mexico; many of the slaves died from the brutal working conditions. Many Yaqui fled to the United States to escape the persecution. Today, the Mexican municipality of Cajeme is named after the fallen Yaqui leader. The Yaqui religion, which is a syncretic religion of old Yaqui beliefs and practices and the Christian teachings of Jesuit and later Franciscan missionaries, relies upon song, music, prayer, and dancing, all performed by designated members of the community. 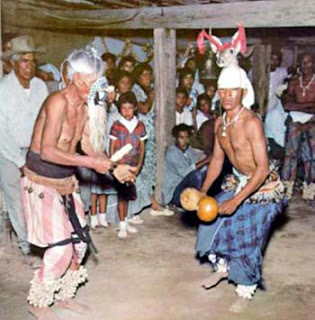 For instance, the Yaqui deer song (maso bwikam) accompanies the deer dance, which is performed by a pascola (Easter, from the Spanish pascua) dancer, also known as a "deer dancer". Pascolas perform at religio-social functions many times of the year, but especially during Lent and Easter. The Yaqui deer song ritual is in many ways similar to the deer song rituals of neighboring Uto-Aztecan people, such as the Mayo. The Yaqui deer song is more central to the cults of its people and is strongly tied in to Roman Catholic beliefs and practices.